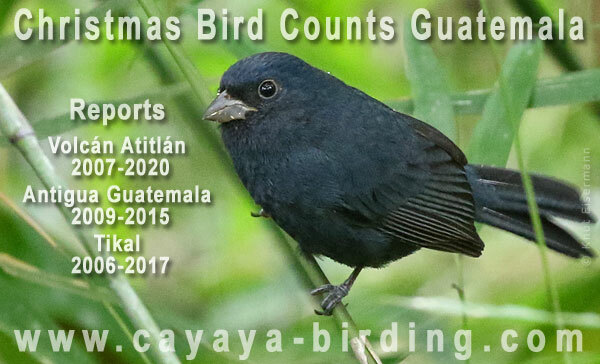 CAYAYA BIRDING has reanimated Christmas Bird Counts in Guatemala. We have founded Christmas Bird Counts in Tikal, Antigua Guatemala, and on Atitlán volcano. The CBC in Tikal in 2006 was the first in Guatemala after a hiatus of more than 30 years. Christmas Bird Counts are conducted on a calender day in the period from December 14th to January 5th. Download a PDF of an article on Christmas Bird Counts in Guatemala, published in the 2011 March issue of BIRDING by the American Birding Association. Coverage of Christmas Bird Counts in the American Birding Association's magazin BIRDING, in the German birding magazin Der Falke, and in the Guatemalan press. To learn more about the history of Christmas Bird Counts in the Americas, visit National Audubon Society's website. More than 50,000 volunteers participate in more than 2,000 Christmas Bird Counts throughout the Americas. Objective of these counts is to monitor the status and distribution of bird populations in the Western Hemisphere. Counts are conducted in a period of 24 hours in a circle of 15 miles diameter. The National Audubon Society coordinates Christmas Bird Counts since 1900.